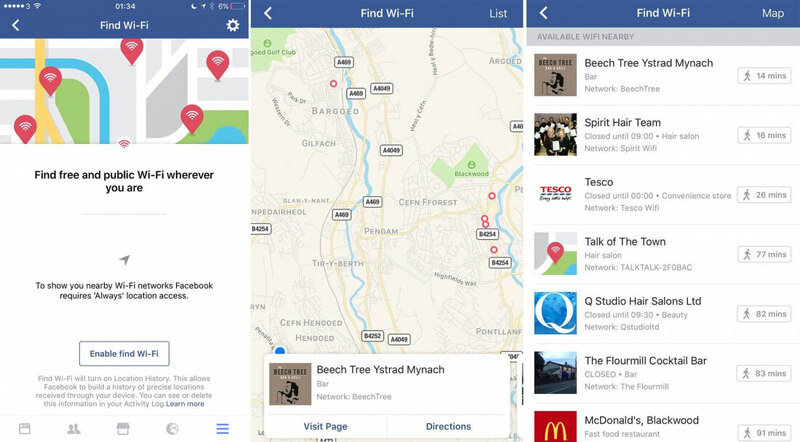 Facebook is quietly rolling out a new feature within its mobile app that will help you find the nearest public WiFi networks you can access for free. First spotted by The Next Web’s Matt Navarra in the iOS app, the feature is still in an early testing stage so for now it’s available to a limited number of users in select countries. For those that have it the option is listed as “Find WiFi" within the menu options in the Facebook app. Toggling the setting will prompt you to allow location services and from there you’ll be able to see places nearby with an access point, the network name, business information and directions. The Next Web notes that Facebook started asking Pages to list Wi-Fi locations at their physical addresses a few months ago, so this seems to be the backbone that the information is built on. Facebook confirmed the feature with a short statement, “To help people stay connected to the friends and experiences they care about, we are rolling out a new feature that surfaces open Wi-Fi networks associated with nearby places.” Find WiFi could be useful for people in emerging markets where mobile data is slow or expensive, people who don’t want to incur heavy roaming charges when traveling internationally, and otherwise pretty much anyone that doesn’t want to eat up their data allowance while using data intensive features like broadcasting through Facebook Live. This isn’t the first time has experimenting with the idea of facilitating Wi-Fi access. Two years ago, the company partnered with Cisco in a pilot program that offered free internet access in participating businesses in exchange for a check in. It has also launched the controversial Free Basics service, which offers a free but limited internet access to people who don’t have it, and is testing infrastructure such as satellites and solar-powered drones to beam the internet direct to remote communities.